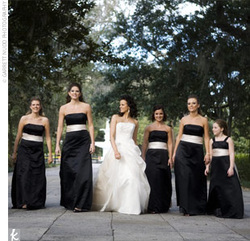 My dress is from David's Bridal (image courtesy of DavidsBridal.com). It was fate when I bought it. I had gone into one just to try on dresses and see what even looked good on me! I tried on about 5 dresses and had found 'the one'. Then, the lady who was helping me said that 'the one' was on clearance for $100-who would pass that up!? So, I bought it! I'm having my bodice taken in, cap sleeves removed, permanent bustle put in and got a new slip thanks to my recent weight loss! They'll all be wearing floor length, black dresses. I don't care where they come from.